Paul Gavarni was the nom de plume of Sulpice Guillaume Chevalier (13 January 1804, Paris – 24 November 1866), a French illustrator, born in Paris. Gavarni's father, Sulpice Chevalier, was from a family line of coopers from Burgundy. Paul began work as a mechanical worker in a machine factory but he saw that to make any progress in his profession, he had to be able to draw; accordingly in his spare time in the evenings, he took classes in drawing. He devoted his special attention to architectural and mechanical drawing and worked at land surveying and mapping which led to his obtaining a position with the Government Ordnance Department as a draughtsman. It wasn't until his early thirties that he turned his attention to his proper vocation as an artist. The story is told that he took his name from Gavarnie in Luz-Saint-Sauveur where he had taken a journey into the Pyrenees. 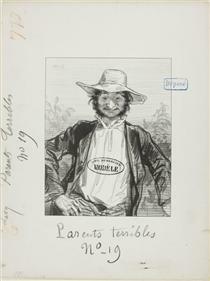 His first published drawings were for the magazine Journal des modes. At the time, Gavarni was barely thirty years of age. His sharp and witty drawings gave these generally commonplace and unartistic figures a life-likeness and an expression which soon won him a name in fashionable circles. He gradually gave greater attention to this more congenial work, and ultimately stopped working as an engineer to become the director of the journal Les Gens du monde. 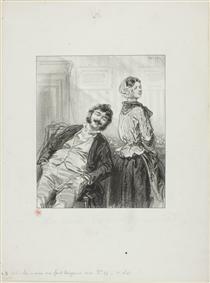 Gavarni followed his interests, and began a series of lithographed sketches in which he portrayed the most striking characteristics, foibles and vices of the various classes of French society. The letterpress explanations attached to his drawings were short, but were forcible and humorous, if sometimes trivial, and were adapted to the particular subjects. At first he confined himself to the study of Parisian manners, more especially those of the Parisian youth. Most of his best work appeared in Le Charivari. 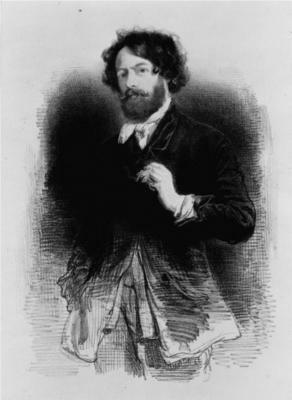 He had been invited by the editor François Caboche to draw for the magazine. 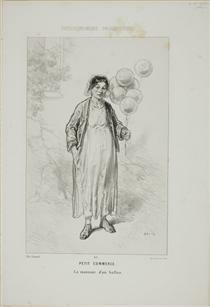 Gavarni had never drawn caricatures and was reluctant to accept the request but was persuaded to submit some drawings for approval. This he did and they were accepted but he didn't care for the captions which had been added by the magazine editors. Thereafter, he started writing his own. This was the beginning of the Boites aux lettres series. 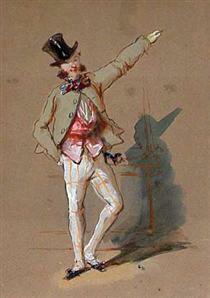 Some of his most scathing and most earnest pictures, the fruit of a visit to London, appeared in L'Illustration. 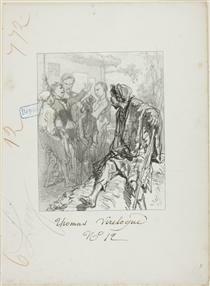 He also illustrated Honoré de Balzac's novels, and Eugène Sue's Wandering Jew. 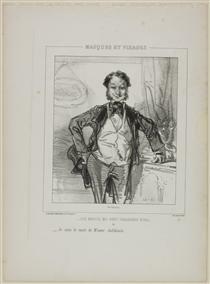 Among his illustrated works were Les Lorettes, Les Actrices, Les Coulisses, Les Fasizionables, Les Gentilshommes bourgeois, Les Artistes, Les Débardeurs, Clichy, Les Étudiants de Paris, Les Baliverneries parisiennes, Les Plaisirs champêtres, Les Bals masqués, Le Carnaval, Les Souvenirs du carnaval, Les Souvenirs du bal Chicard, La Vie des jeunes hommes, and Les Patois de Paris. He had now ceased to be director of Les Gens du monde; but he was engaged as ordinary caricaturist of Le Charivari, and, while making the fortune of the paper, he made his own. 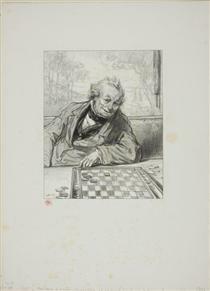 His name was exceedingly popular, arid his illustrations for books were eagerly sought for by publishers. 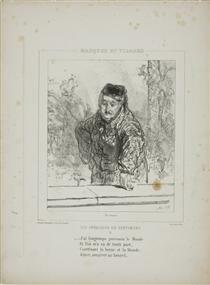 Le Juif errant, by Eugene Sue (1843, 4 vols. 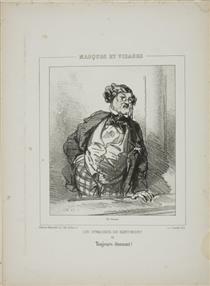 8vo), the French translation of Hoffman's tales (1843, 8 vo), the first collective edition of Balzac's works (Paris, Houssiaux, 1850, 20 vols. 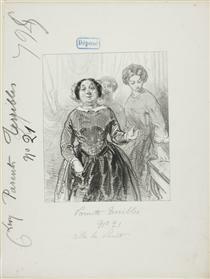 8 vo), Le Diable à Paris (1844–1846, 2 vols. 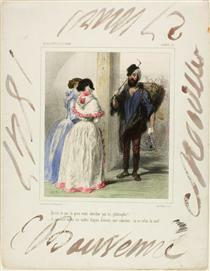 4 vo), Les Français peints par eux-mêmes (1840–1843, 9 vols. 8vo), the collection of Physiologies published by Aubert in 38 vols. 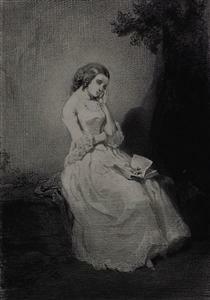 18mo (1840–1842), all owed a great part of their success at the time, and are still sought for, on account of the clever and telling sketches contributed by Gavarni. Dandy in Paris Paul Gavarni ? 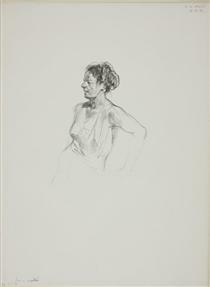 Untitled (half drunk) Paul Gavarni ?